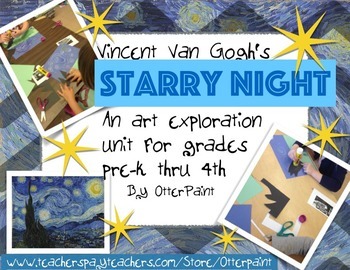 Van Gogh Starry Night Unit Plan with Printables. This is a super fun way to look at art with your students! Chock full of activities, this unit will have your students using descriptive words, discussing art, using their fine motor skills and engaging in creative problem solving. 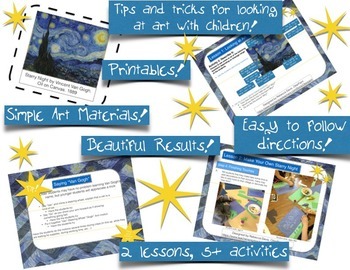 -An activity for looking closely at Van Gogh's "Starry Night". -Discussion points to engage young learners in a talk about the painting. -Large printable of Starry Night. 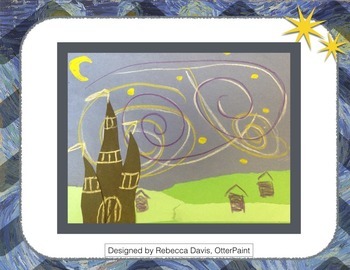 -Student copies of Starry Night for students to paste to the back of their project. -A mini-activity for learning to say "Van Gogh". Your students will be able to create a beautiful piece of art that they will be proud to show off using simple art materials that you probably already have on hand. 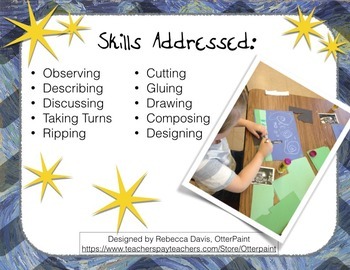 It makes a great piece for bulletin boards, family night or art shows! Directions are specific and easy to follow, this unit is easy to teach for artists and non-artists alike! Created by OtterPaint, all clip-art/designs are original.